A Dark, Sweet Mellow Rum Styled on the Seafaring Rums of Old! Best Straight with Ice, or Enjoyed with Cola! Makes a single malt style, whiskey flavour. With scents of lemon zest, toffee apples, and subtle coconut notes! A Mellow Rum with Subtle Tones of Liqourice, Golden Syrup and Molasses. The Distinctive Taste of American White Oak gives this Rum a Complex Yet Smooth Aftertaste. This quintessential example of single malt style essence gives light fruit notes and a smooth golden colour. Enjoyed with a touch of water to release rich, unique cut hay aromas, reminiscent of the Valley of Deer, the definitive single malt whisky. and yet Mellow and Smooth, Great over Ice but also Great with Cola. A Unique Blend of Several of the Best Distillations from Fermented Grains Combined to give this Whisky Outstanding Flavour and Aroma. One of its Distinctive Qualities is the Unique Smokey Quality Gained from the Peat. 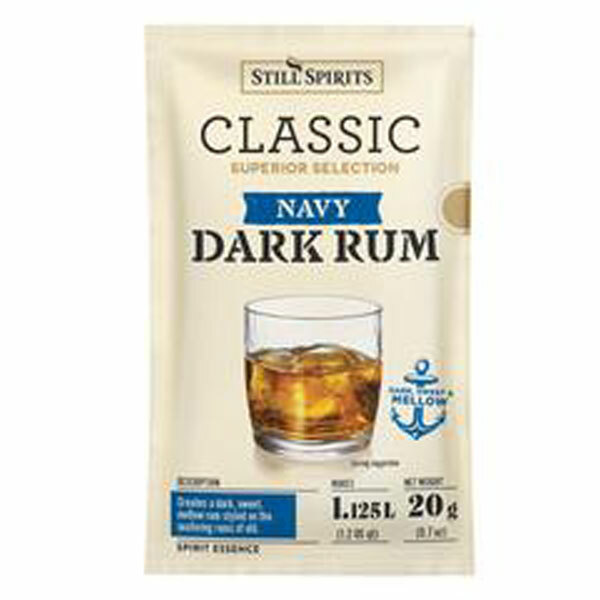 Creates a smooth, light bodied rum, slightly sweet in flavour with subtle tones of molasses. Makes 2.25ltrs.